Everyone knows that vi and vim are better than emacs right? Well personally I prefer nano even over vi. 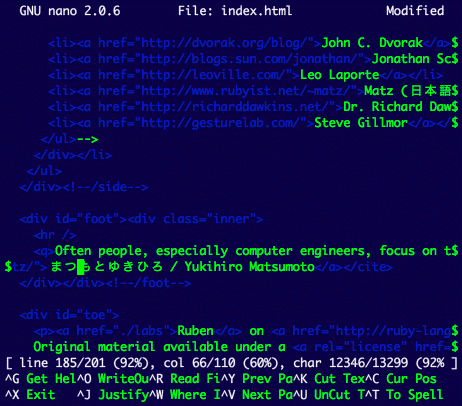 It was the first text editor I ever learned (okay it was actually pico, the editor it was cloned from) on UNIX and even now I use it for almost everything: Ruby, Perl, HTML, XML, KitchenSink… even these weblog posts. It's a small world, so why not use a small editor? Hey, that's catchy. The problem though if you install Nano from MacPorts is that it's not enabled with a number of what I would consider critical features. Aside from syntax highlighting support probably the most noticeable of which is the lack of UTF-8 support which means it spits out a series of question marks whenever you're editing files with katakana, kanji and kitchen-sink in it for example. Bummer.